Crankworx features the biggest stop on the Freeride Mountain Bike (FMB) tour, a World Cup Enduro, the Canada Cup DH Finals, the famous Air DH, Unofficial Whip-Off World Championships, and even one of the longest Downhill races in the world (Garbonzo DH), but year after year the event with the most participants was more of an afterhthought named ‘Kidsworx’. Though it changed from year to year, the event always consisted of a series of ‘races’ along simple short courses suitable for any young riders, from runbikes to mini dh steeds. Years of long lineups and crowds of smiling faces have lead Crankworx to add full fledged kids races over the week. Now, rippers 7 and up can try their hand at racing B-Line (a simple smooth trail in the Whistler BIke Park (WBP)), A-Line (the world’s most popular mountain bike trail, also in the WBP), the pump track challenge, or even the Fat Tire Crit. Some of the races require that your grom gets pre-screened to make sure their ability level is up to par before tackling some of the harder races, so check out crankworkx.com before registering. While most little rippers will have more choices than ever, some will sadly be left behind as the expansion has made the old event much more run-bike specific, while limiting participation in any of the races to 7 years and older. 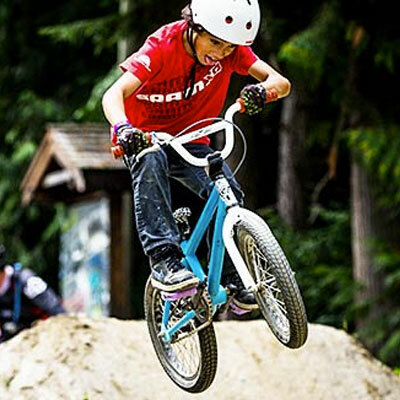 This means if your grom is from 4 to 6 years old and likely riding a pedal bike, there’s not much for their skill level (strange as Whistler offers their DFX camp starting at 4 years which regularly takes kids as young as 5 into the bike park). That said there’s more than enough ‘participatory’ events, spectacles, autograph signings, and general great vibe to make this a fantastic event for kids of any age. Kidsworx (and it’s big brother Crankworx) run from August 8th to 17th, check out their site for event details.